For Immediate Release- Oklahoma City, Okla., January 9, 2017- Thanks to the success of his offspring at the 2016 National Reining Horse Association (NRHA) Futurity, we are excited to announce that Gunnatrashya is NRHA’s newest Million Dollar Sire. 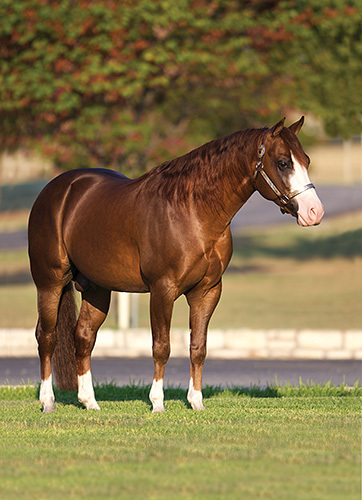 Owned by Arcese Quarter Horses USA, Gunnatrashya is by NRHA Hall of Fame Inductee and Eight Million Dollar Sire Gunner and out of Natrasha. The 2006 Sorrel stallion has had just as successful a career in the show pen as he has in the breeding shed. With NRHA Five Million Dollar Rider and Hall of Fame Inductee Shawn Flarida at the reins, Gunnatrashya was the 2009 All American Quarter Horse Congress Open Futurity Champion, 2009 NRHA Open Futurity Champion, and 2010 NRHA Open Derby Champion. Even with limited showing, his NRHA Lifetime Earnings are over $218,000. Gunnatrashya had 22 offspring entered in the 2016 NRHA Futurity, and together they earned more than $82,496 at the event, giving him a lifetime total of $1,017,438 in offspring earnings. One of the most notable offspring was Loveya, owned by Cam Essick, who won more than $48,937 alone. Loveya was Level (L) 2 Open Reserve Champion, L3 Open fifth place, and a L4 finalist at the Futurity. Additionally, Bugattti, owned by Jay Prather, earned over $13,453 and Dontrashmystage, owned by Dale Harvey, won more than $12,764. Congratulations to Gunnatrashya and Arcese Quarter Horses on this outstanding achievement!